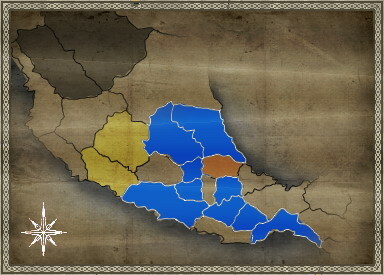 The Aztec Empire of the Triple Alliance dominates the heart of the New World. Formed by the three great cities of Tlacopan, Texcoco, and the Aztec capital of Tenochtitlan, it is ruled by Moctezuma II, the ‘Hueyi Tlatoani’, or great speaker. Made up of three separate tribes, the Aztec alliance acquires its name from the dominant Mexica tribe, known amongst the others as the ‘Aztecs’. The Alliance rules over many nearby city-states, enforcing tribute on pain of invasion and sacrifice.The Aztecs primarily worship Huitzilopochtli, the god of war and the sun, who struggles constantly to hold back the darkness and requires nourishment in the form of human sacrifice. The Aztecs believe the world may end at the end of a 52 year cycle, which is quickly approaching, unless they can keep Huitzilopochtli strong. It is this need for sacrifices that drives the Aztecs to conquest. New territories mean new populations that can be used as slaves and, more importantly, sacrifices to stave off the end of the world.There have been many troubling portents for the Aztecs lately. A comet has been seen streaking through the heavens, the temple of Huitzilopochtli was destroyed by a great fire, and another temple was destroyed by a bolt of lightening! For the Aztecs, these are sure signs of defeat and conquest. If these omens were not worrying enough, a mysterious ghost woman has been seen wailing through the night and strange visions of men riding deer have been seen. The Aztecs are surrounded by enemies - the Tlaxcalas to the east, Tarascans to the west and Chichimecs to the north. However, it seems unlikely that any one of them could overcome the mighty Aztec empire, and many Aztecs think the omens are but a test of their faith.The Aztecs utilise many brave and fearsome warriors, including the Jaguar and Eagle orders. Their lack of cavalry is compensated by the overwhelming number of fierce warriors they can field.